We’ve spent a lot of time recently talking about riding cool bikes, wanting to ride other cool bikes and what happens when you spend too long out with other women. 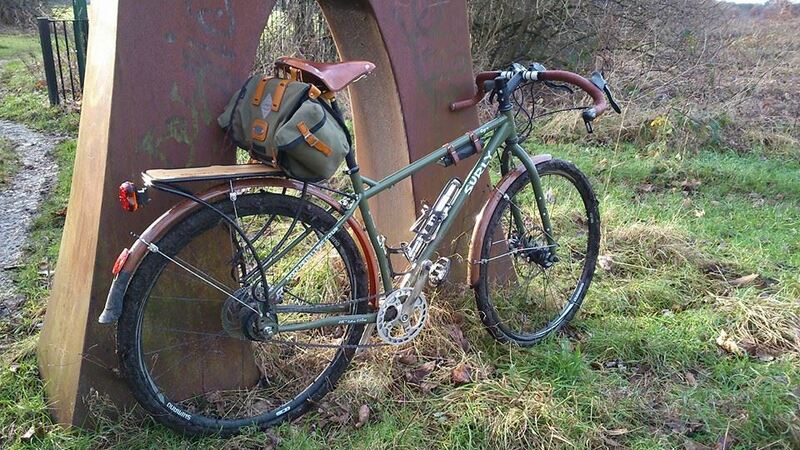 I can see you all there, on the edges of your seats, holding your collective breath just waiting for an update on the much anticipated Surly Ogre build. Well, wait no more dear reader, the Ogre is finally experiencing life in the cycle lane. 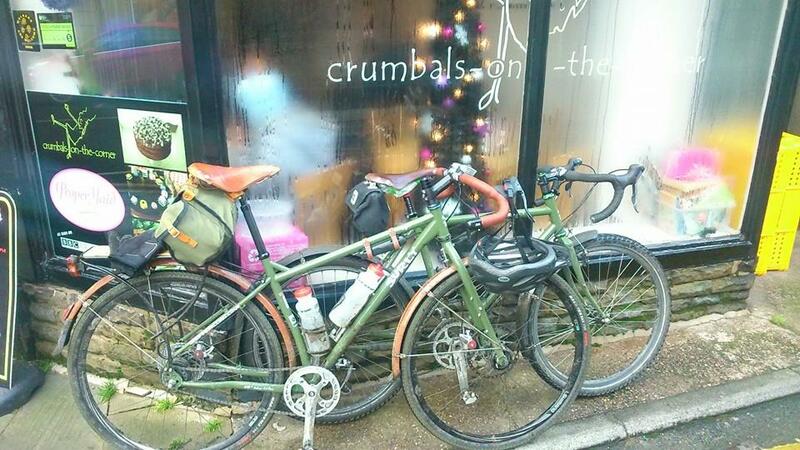 Seen here enjoying a much needed break at the very excellent Crumbals on the corner in Marsden, Huddersfield, the eagle-eyed and elephant-brained regulars amongst you may well recognise the On One Midge bars, Cane Creek SCR-5 brake levers and Avid BB5 road disc brakes from early iterations of my Surly Troll. 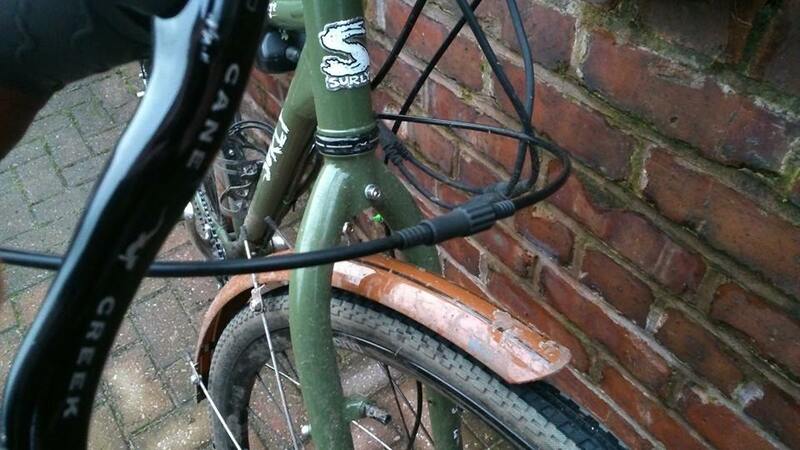 I’ve also pinched the Brooks B17 World Traveller special edition saddle from my Troll which has started to turn a lovely orangey-brown colour which, whilst not an exact match, works extremely well with the brown Deda bar tape, brown Vavert full wrap mudguards and army green frameset. The Ogre shares the same horizontal track style dropouts found on the Troll which allow you to slide the rear wheel back and forth to achieve just the right position and, crucially with single speed and internal gear hub (IGH) setups, the right amount of chain tension. I’m almost embarrased to admit that mine was all floppy on chrimbo day. 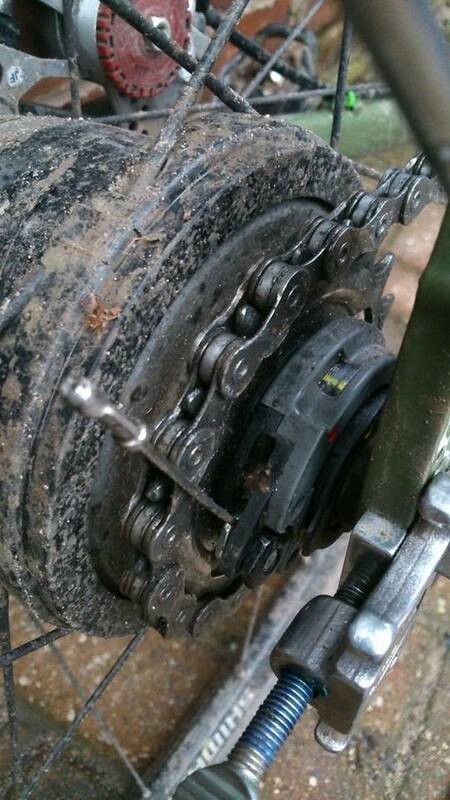 You see, I was relying on the force applied by simply tightening the axle nuts to keep my rear wheel in place. What I hadn’t realised was that with all the out-the-saddle climbing I’d been doing, the force I was putting through the drivetrain was enough to cause the wheel to slip forward in the dropouts. Not much, but enough to achieve said floppyness. Living in t’ North as I do and given the fact I actually really enjoying climbing (despite my complaining), option 1 really isn’t an option. Option 2 is out too because it’s nonsense to have sliding dropouts and a derailleur style chain tensioner, besides which I want to retain the clean look. So, option 3 it is. But wait! 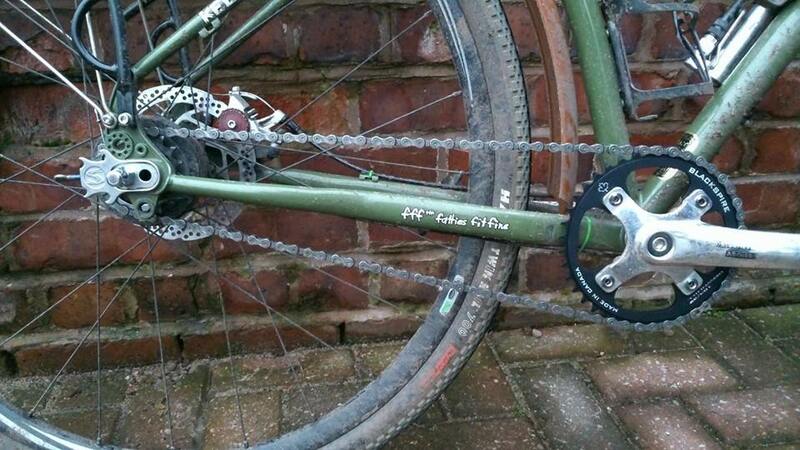 Because of how the Alfine hub works, you need to install special non-turn washers which of course aren’t designed to work with the Surly Tuggnut (other inferior chain tensioners are also available). Punch “Surly Tuggnut Alfine” into your search engine of choice and there is plenty of discussion on the forums about how to modify your Tuggnut to work. My favourite solution and the one I ended up going with was really the simplest: just throw away one of your non turn washers. As it turns out, you really only need one to do the job of holding the axle in place – taken care of by the left hand (white) one in the picture above. On the drive side of the bike, simply remove the sliver washer, fit your Surly Tuggnut as normal, snug up the thumbscrew to achieve the all important chain tension and hey presto, nothing floppy in sight and you’ve got the ability to crack open a cold one at the end of your ride thanks to the built in bottle opener. Sweet. It’s important to note here that there are various different coloured non turn washers for the various different shaped dropouts out there and unless you have true horizontal ones like mine, this solution really isn’t for you. I dare say it’s not recommended by Shimano to run your Alfine with only one non turn washer and I’m fairly sure the good folk at Surly wouldn’t recommend any of the above with the probable exception of drinking beer. Remember kids, read and follow the manufacturers’ instructions [sic]. 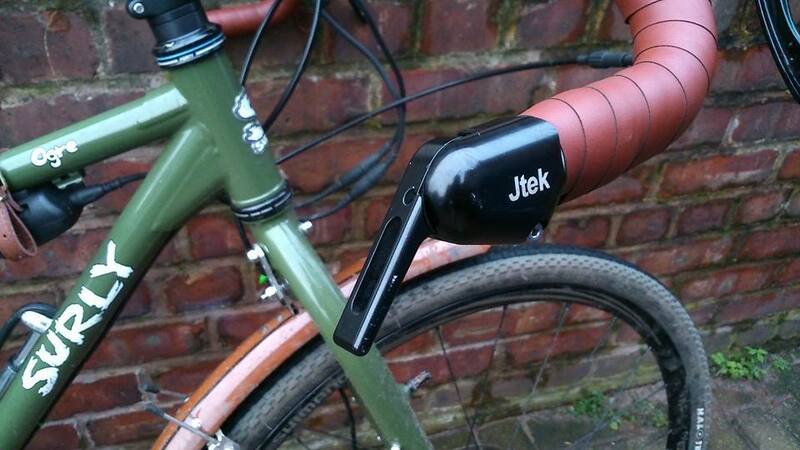 Shifting comes courtesy of a Jtek bar end shifter. Not the one I ordered direct from The States, waited ages for, waited a bit longer for, got tired of waiting for and cancelled, but one I bought second hand from a guy who knows a guy who knows a guy who had one lying around in his parts box. With reassuringly industrial indexing at the shifter (not the hub), there is a very satisfying click every time you change gear and none of the imprecise feel I’m told you get with the Rohloff which is indexed at the hub, not the shifter. 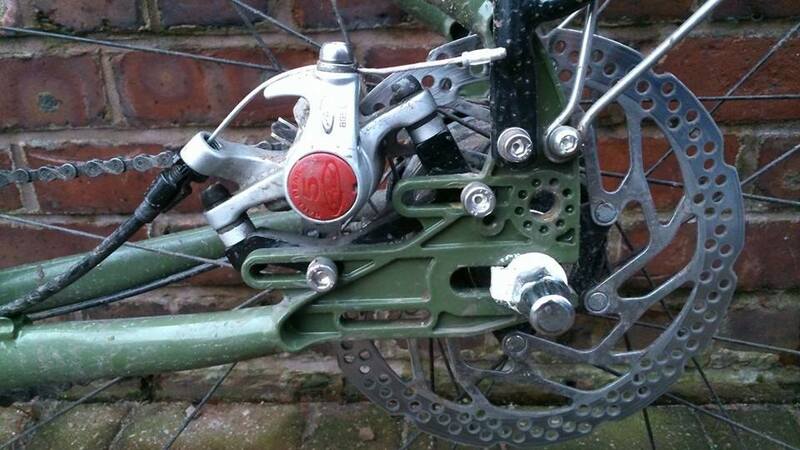 The Alfine hub is particualrly sensitive to gear cable tension, thanks largely to the decidedly el cheapo plastic the ‘cassette joint’ is made from. Once installed, you need to shift to the lowest gear (1), attach the cable inner to the fiddly little cable clamp and pop it into place. Next, shift to gear 4 and you’ll see two little marks in a small window in the cassette joint. The game now is to get them both perfectly lined up. I’m reliably informed this is damn near impossible without the help of an in-line cable adjuster; which is why I didn’t question it and fitted one up near the shifter (it doesn’t really matter where you install it, just so long as you have one somewhere accessible). You’re going to want to take care of all your chain tension and other rear wheel movement and get it tightened down in its final position before you go anywhere near the cable tension, incidentally. Of course, every time you whip the wheel out for a puncture, tyre change or whatever, make doubly sure to re-check your gear cable tension because I guarantee you it won’t be right (another reason for the Tuggnut – the wheel always goes back in exactly the same place). Oh, I almost forgot! 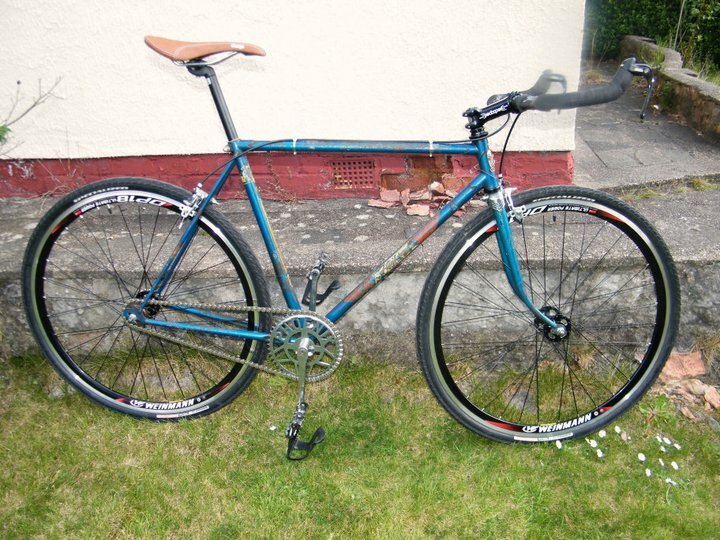 Originally I’d planned to fit a Shimano Alfine chainset to match the wheelset but it turned out to be suitable only for 68mm bottom bracket shells and I have a 73mm shell on the Ogre. The solution came in the shape of a Sturmey Archer single speed chainset and traditional square taper bottom bracket – nothin’ fancy. 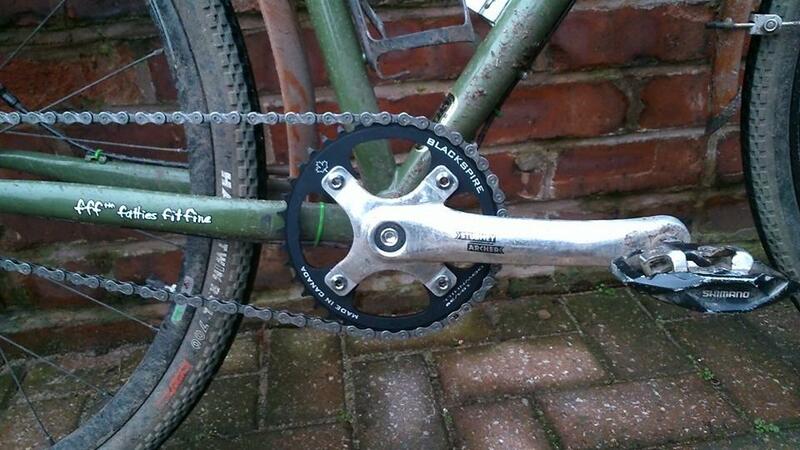 You’ll see on the first couple of pictures on this post that it originally came with a 44t chainring and what turns out to be a nasty silver chain guard; coupled with the 18t rear cog I ended up using, this resulted in gearing that is just a bit too high for my liking. 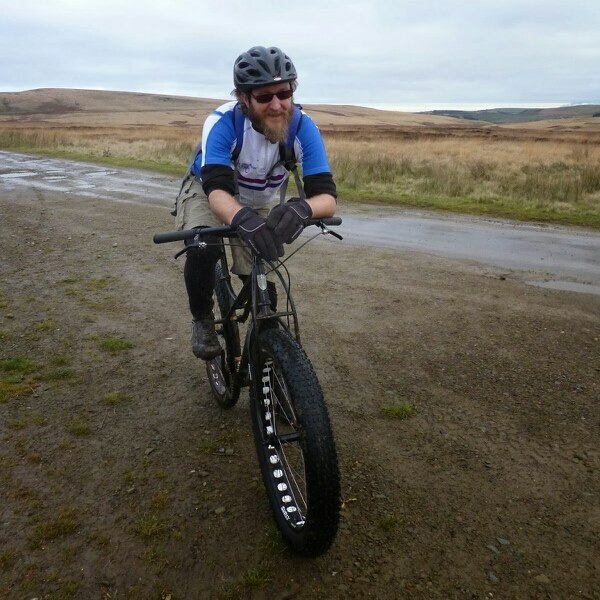 In t’ hills I find myself almost exclusively out of the saddle and even hooning down a long descent with the wind behind me, I still can’t make any real use of the 2 highest gears. Not wanting to go through the hassle or expense of sourcing yet another chainset, I simply ordered a new, smaller chainring (104mm BCD for the nerds out there) and took a link out of my chain so I’m now running with a rather fancy looking Blackspire 39t Downhill chainring up front and an 18t cog in the rear. I’ll be heading out on it tomorrow to test out the new combination which will hopefully give me a good balance of high speed on the flats and relatively low gearing on the climbs. Well, I think that’s about all there is to report for now – more in the next few weeks! Last Friday I was promoted at work. Last Saturday Karen and I had a lovely time with our friends over in Glossop selling cake to the masses. 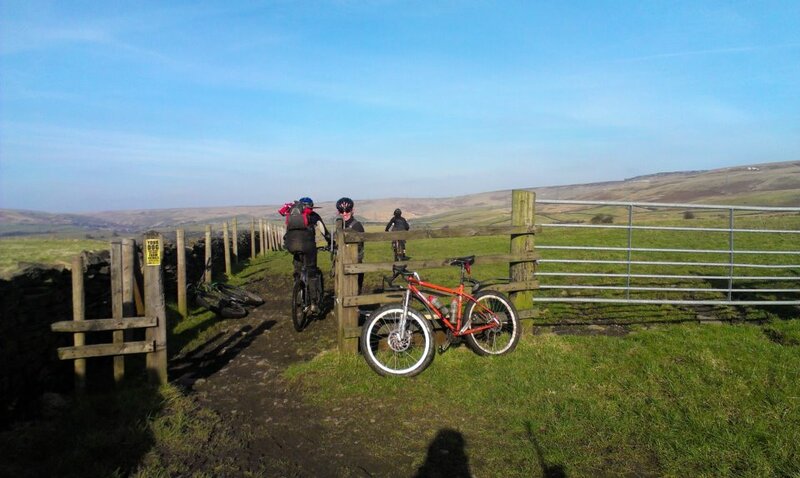 Last Sunday I went mountain biking in t’ Pennines with the good folk from Keep Pedalling, Manchester. As weekends go, it wasn’t too bad. 1. 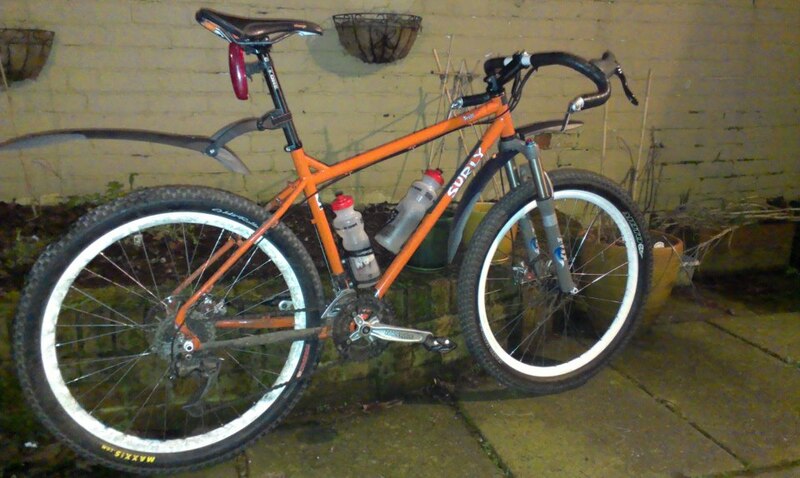 It’s a hardtail, no question. 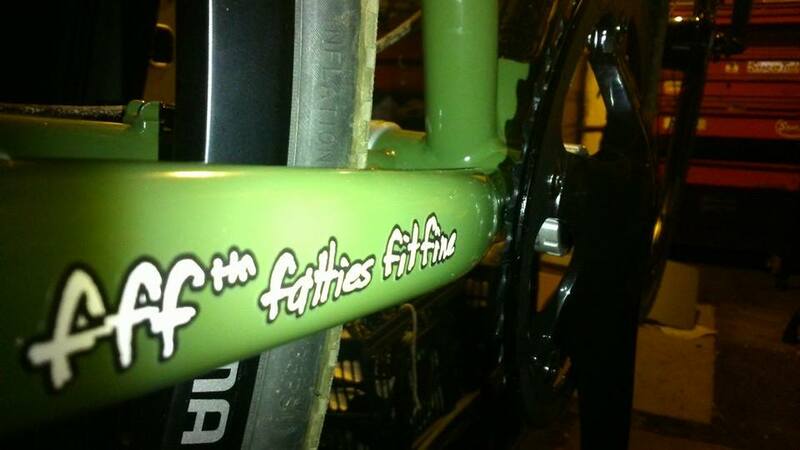 This may seem an obvious statement but apparently a lot of folks out there are comparing it with full suspension frames. The Jones website may hold some clues to why as it states “A Jones is a high-performance non-suspended bicycle. The ride is both efficient and comfortable and the handling is immediate and assured. 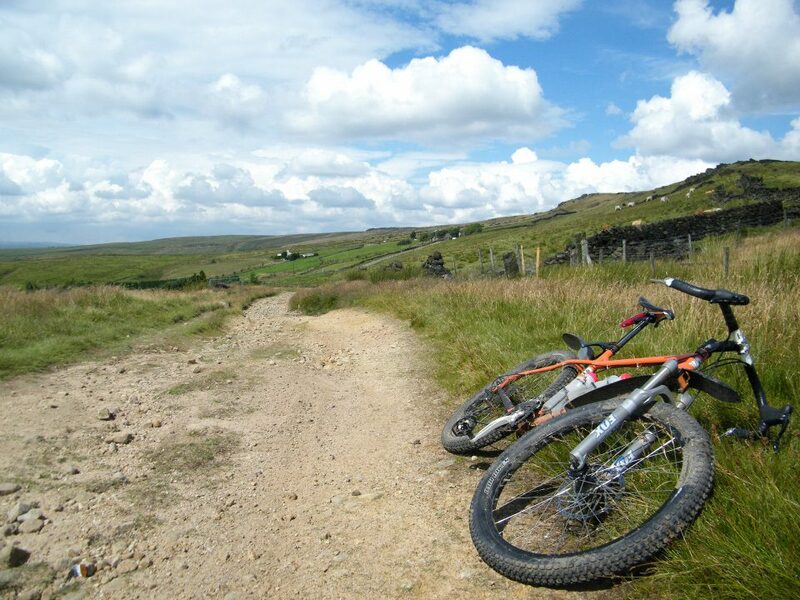 With the default choice for off-road cycling nowadays seemingly suspension before anything else it might seem odd to ride rigid but that is the last thing my bicycles are – the geometry and construction provide an extremely satisfying and direct connection between the rider, the trail and the bike. 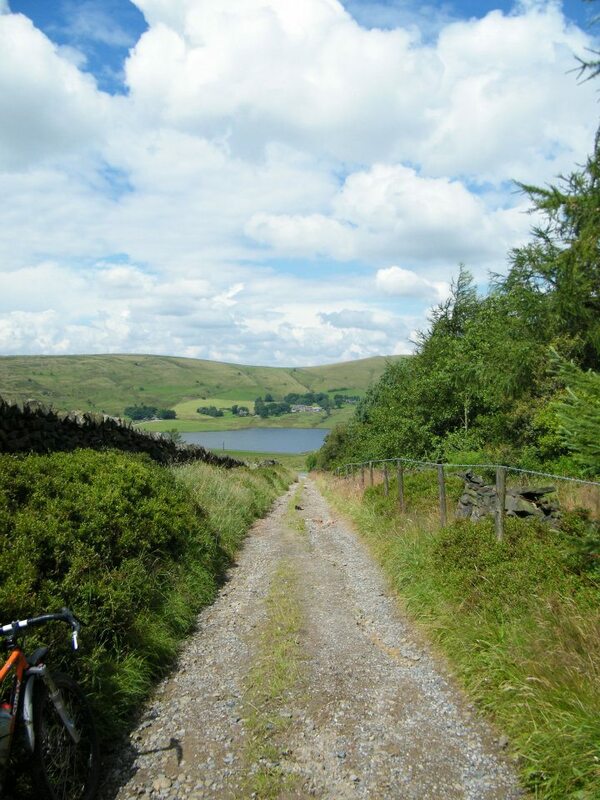 It’s pure cycling and a lot of fun.”. I think the confusion comes from all the talk of suspension. What Jeff’s trying to say here is that, despite being fully ‘rigid’, his bikes don’t have a ‘rigid’ feel; equally, he’s not saying his bikes have some kind of ‘suspension effect’. 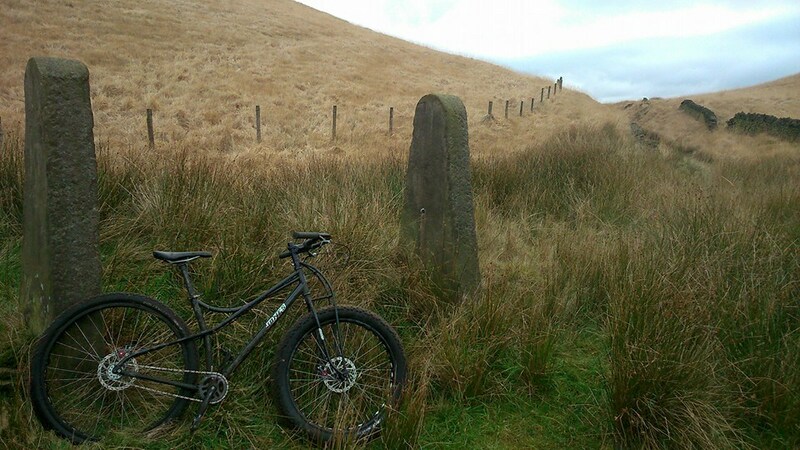 Really good steel hardtails (in my humble opinion) are the best choice for off road riding because you really do get a direct connection between you, the bike and whatever you’re riding over. With a full suspension bike, the rear end is flopping about, you’re bouncing around and by the very design of the thing, you don’t have that direct connection. For me, this eliminates most of the experience and, of course, a certain amount of the energy you’re putting into the pedals is getting soaked up by the suspension. It’s kinda like comparing apples & bananas. 2. ‘Half fat’ is fun but it isn’t for me. 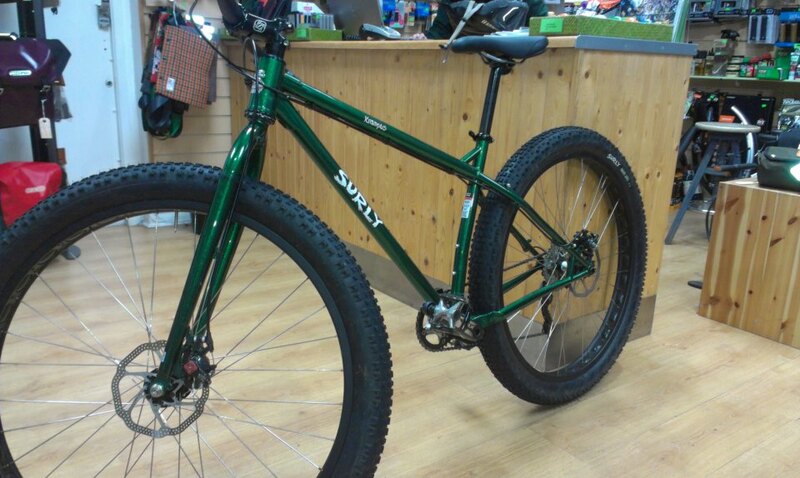 The bike I was riding had been built up with a 29er rear wheel and a 26″ fat bike wheel from our good friends over at Surly. I don’t know the exact measurements but because of the extra rubber up front, the rolling diameter of the mismatched wheels ends up being almost exactly the same. Fat tyres run at surprisingly low pressures (they were after all originally designed for riding on soft stuff like snow and sand) which provides plenty of ‘float’ and they’re generally quite squidgy. I guess that qualifies as some kind of ‘suspension effect’. 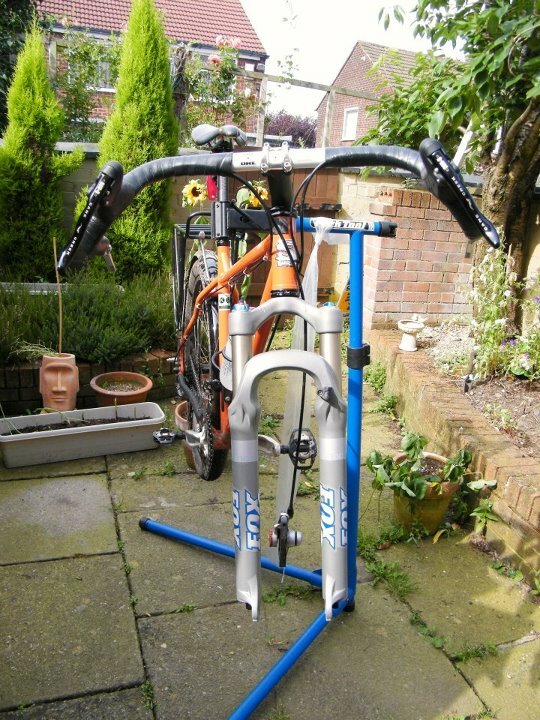 But again, comparing a rigid fork with fat tyre to a suspension fork is kinda like comparing a screwdriver to a hammer… both are perfectly good tools and, used in the appropriate application, will do a fine job. However, if you need to hammer in a nail, a posi #2 isn’t really what you want. 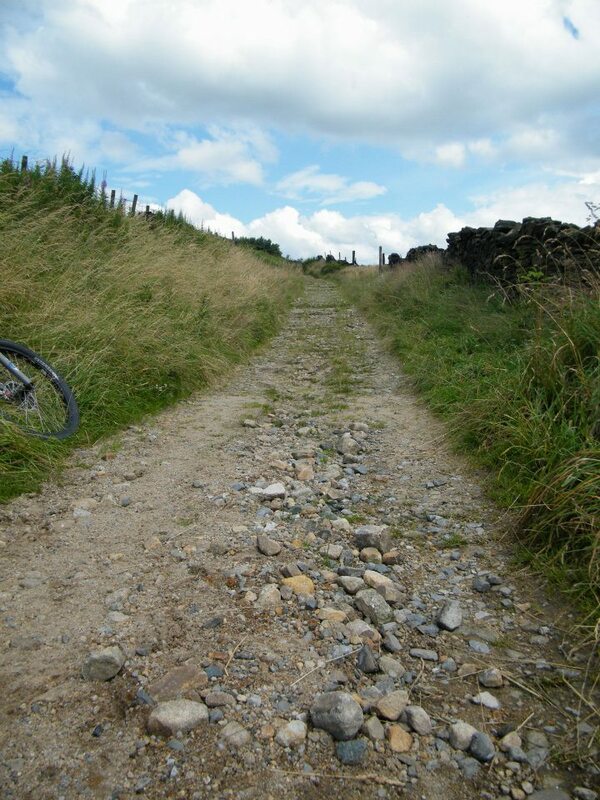 We were riding on fairly tricky trails with a healthy mixture of deep ruts and flooded bogs. In the ruts (and this is probably my lack of talent showing), I found the front tyre a bit too wide and a bit too eager to grab hold of the sides. Worse than that (and with more lack of talent showing), on the approach to a boggy section, the front end just floated over whatever I pointed it at whilst the rear schlurped into the mud up to the axle. This is by no means the fault of the bike. 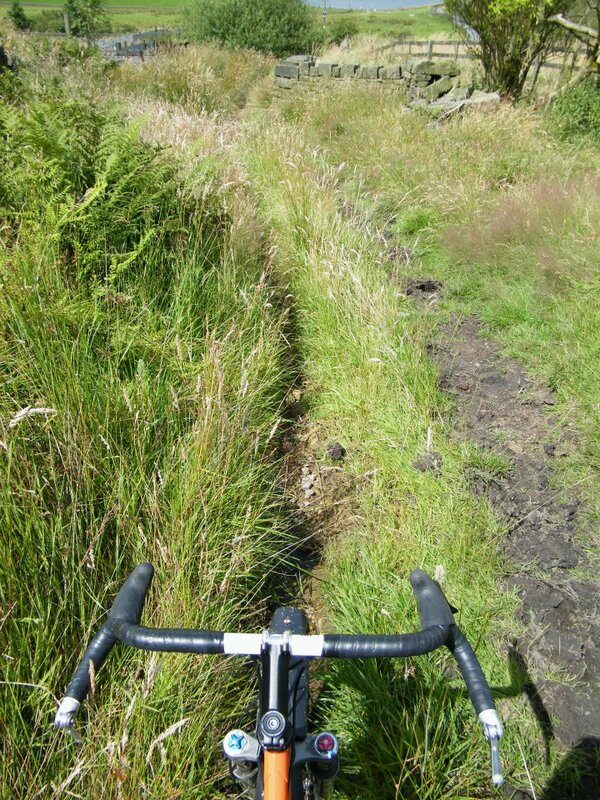 I should’ve picked my line more carefully and I certainly should’ve put more effort into trying to drive through the bog… Looking down at that front tyre, I guess I just kept forgetting I couldn’t float the rear wheel through too. 3. Single speed is also fun but also isn’t for me. I’ve built a couple of single speeds over the years and for a long time, it was my ride of choice; the thing with single speeds is you need to have enough strength in your thighs to get the thing up to speed and then maintain it. These days, my body has become conditioned to maintaining a steady cadence using the full range of the 27 speed setup I run on all my bikes and, as a result, my thigh muscles aren’t actually that strong. At least this is my feeble excuse for not being able to monster the Jones up the hills as impressively as I would’ve liked. 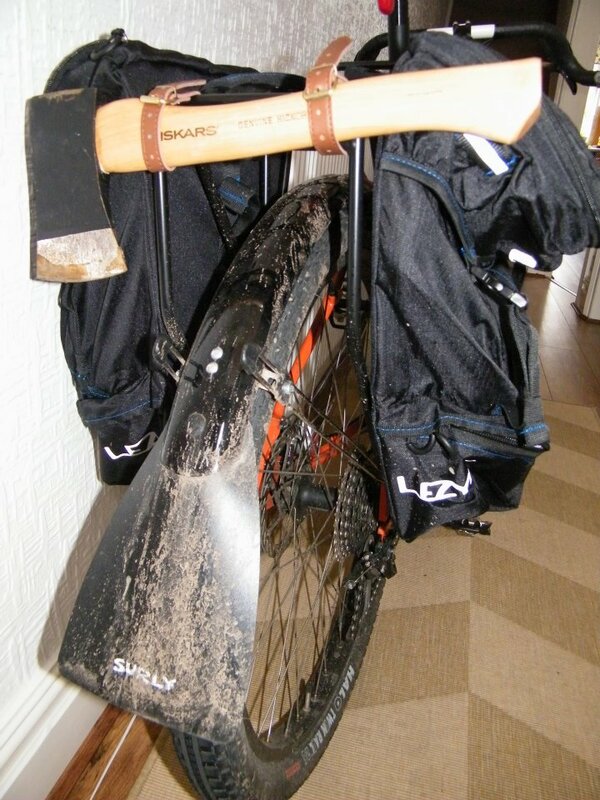 People who ride single speed mountain bikes are the special kind of crazy. And, I salute them for it. 4. Jones Loop Bars are awesome. Treat yourself to a Surly Troll, a Surly Ogre or (obviously) anything from Jeff Jones and chances are it’ll come with a set of Jones Loop Bars as standard. If you’re not familiar with them, you can read all about the various incarnations of the Loop Bar here. Originally, I built my Surly Troll with a set of On One Midge bars so I’ve only recently been lucky enough to own a set of Jeff’s horribly expensive yet incredibly excellent bars. For several months, I used them for commuting (mostly on road), making good use of the various hand positions and enjoying the stability all that extra width gives. 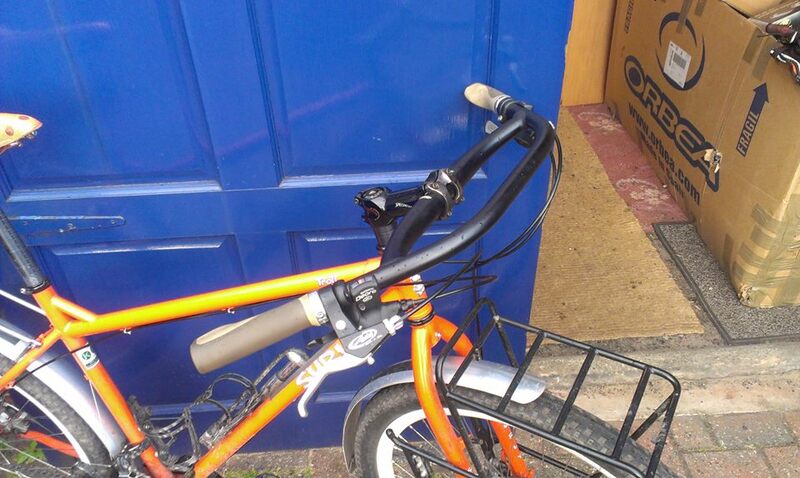 More recently, I’ve been using them off road and they’re transfomed my Troll into the highly capable mountain bike I always suspected it would be. I’m still getting used to them and on occasion I still find them a little too wide but coupled to the Jones Spaceframe and Truss Fork, they make perfect sense. Just the right width, all the hand positions you could possibly need off road and as cool as hell. What’s not to like? 5. I’d rather have a Krampus. 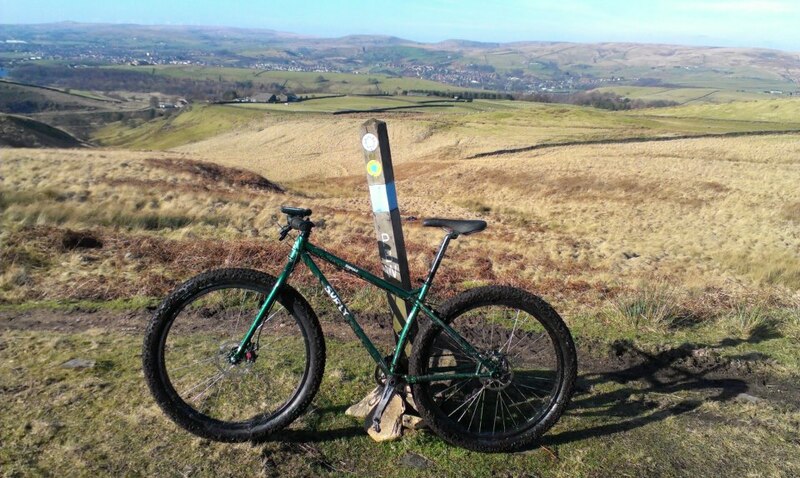 I’m lucky enough to have had a sneak preview ride of the legendary Surly Krampus before it was freely available in the UK. 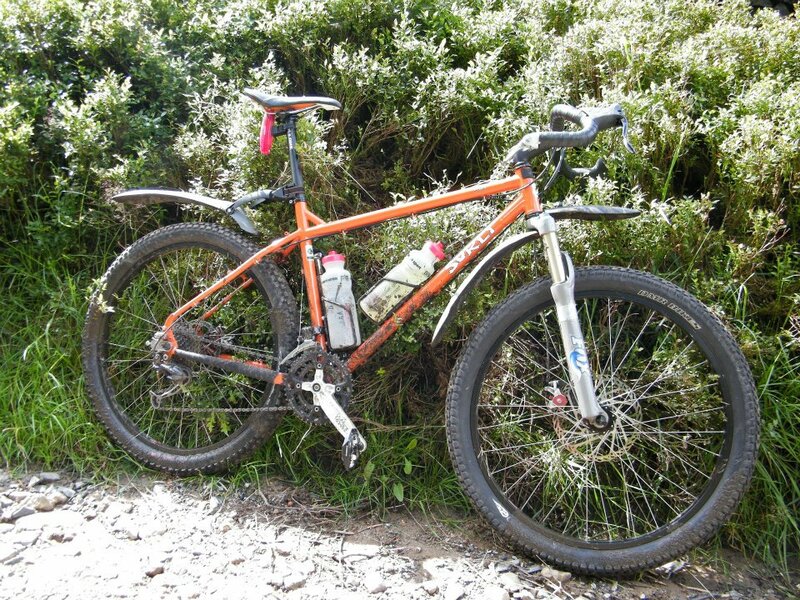 The one I was riding had a 1×10 drivetrain, 29er wheels, wide handlebars and a rigid fork; making it quite a fair comparator for the Jones. What’s more, I rode the Krampus and the Jones on some of the very same trails in extremely similar conditions at the same time of year with many of the same people. To the best of my knowledge, I didn’t crash the Krampus. I remember thinking I would’ve liked one more low gear and the bars were a touch too wide for my taste but otherwise I loved everything about that bike. It’s also considerably cheaper than the Jones which makes the unavoidable justifying-buying-it-to-your-other-half conversation so much easier. Anyway, I’ve always put these odd looks down to my homeless guy beard, my patented so-long-and-messy-it’s-not-actually-messy hairstyle and my rock hard body (OK, I made that last one up) but recently I’ve been getting more looks and pointing children than is normal, even for me. And the cause of this fascination? Well, I live in (but am not originally from) Manchester so maybe the local wildlife is trying to figure out why I’m not dressed in a tracksuit, don’t look like a member of Oasis and haven’t got a ‘retro’ vinyl Lonsdale sports bag permanently slung over my shoulder. But no, I suspect it’s something much simpler than that. Powder coated in a shade of bright orange any Manc would be kill to have a tracksuit made in, my Surly Troll and its matching bright orange Ortlieb panniers is the kind of thing that stops people in their tracks and makes them say things like “Maaate, look at them tyres”, “F**k me, he means business” and the suchlike… I don’t know, maybe they’re only used to seeing bikes right before they cut the locks off. Attach my BOB Yak to the Troll and even the traffic stops to gawp. This has its benefits of course, primary amongst which is the extra room you’re given on the road but it’s certainly not the kind of thing you want to do if you’re self concious. This week, I realised the bearings in my wheel hubs had reached the end of their usable lives and were slowly but surely eating themselves resulting in the kind of noise that forced me into the bike shop (yeah, right, I need to be forced to go there) and further forced me to determine that buying a brand spangley new wheelset would make more financial sense than having the current hubs rebuilt; my girlfriend was not quite so easily convinced. Yep, as if it wasn’t already a head turner, those white rims are only going to make it stand out more! So this morning I attached my BOB Yak single wheel cargo trailer to the Troll using the dedicated BOB Nutz I spent so long fitting to the frame and dragged it into work so I could pick up my new wheels on the way home. 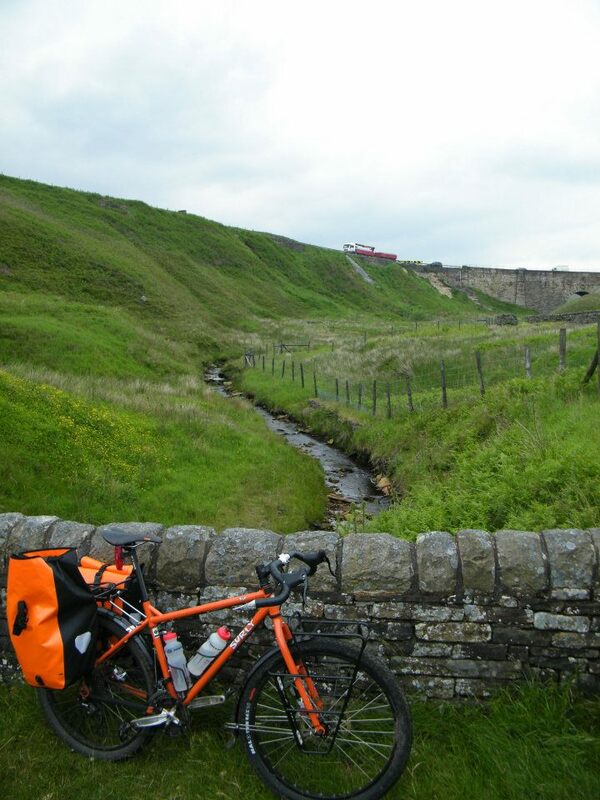 It’s a fairly odd experience pulling an empty trailer behind the bike and it certainly provokes more than a few odd looks; it also has a disturbing tendency to spring into the air if you crash it through a big enough pothole – you have been warned. Loaded up with a bit of weight however, the Yak starts making all kinds of sense; it stays planted thanks to the really low centre of gravity and, because it mounts from both sides of the frame and has a single wheel at the back, it leans with the bike, flows through corners in a perfect curve with the bike and comes with almost no aero drag because it’s no wider than the bike. It really is genius. The Troll too is weird. The geometry of the frame is all kinds of bizarre, no matter which way you slice it; stick drop bars on like I have and it just gets stranger… But again, start weighing it down with stuff & things and it all makes perfect sense. 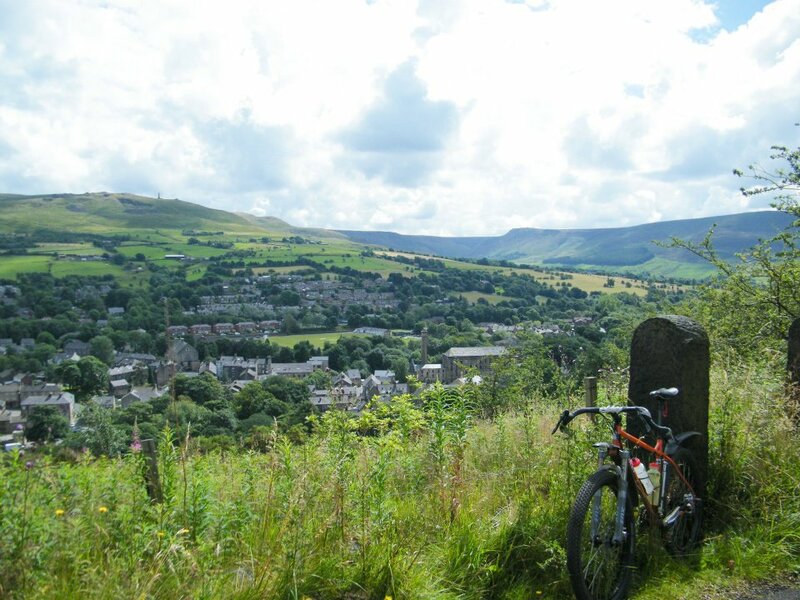 The awesome people over at Keep Pedalling in Manchester (yes, it’s a shameless plug – go there and spend money!) have been really good to me, offering to take in a delivery of the afore mentioned stuff & things this week which I picked up today with my wheels – I’d got the Troll & the Yak… what could possibly go wrong? Well, nothing as it turns out! 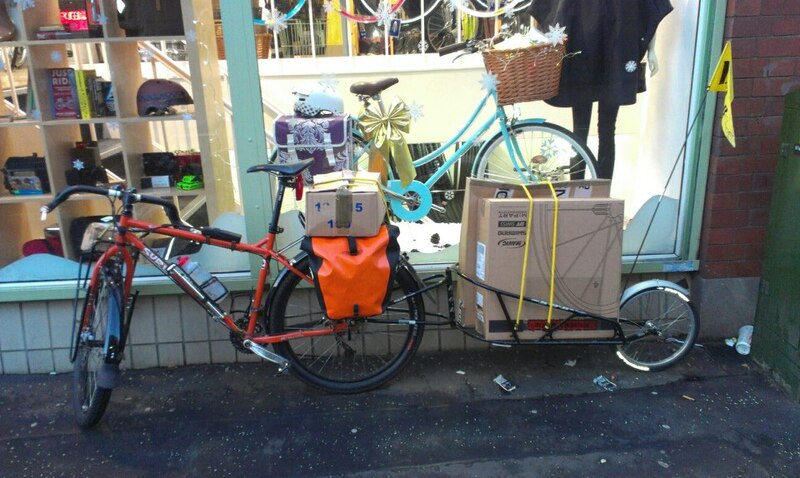 It has to be said, I wasn’t quite expecting so many stuff & things to be there but I somehow managed to stuff it all into my panniers, strap it onto my front & rear racks and load it into the trailer. 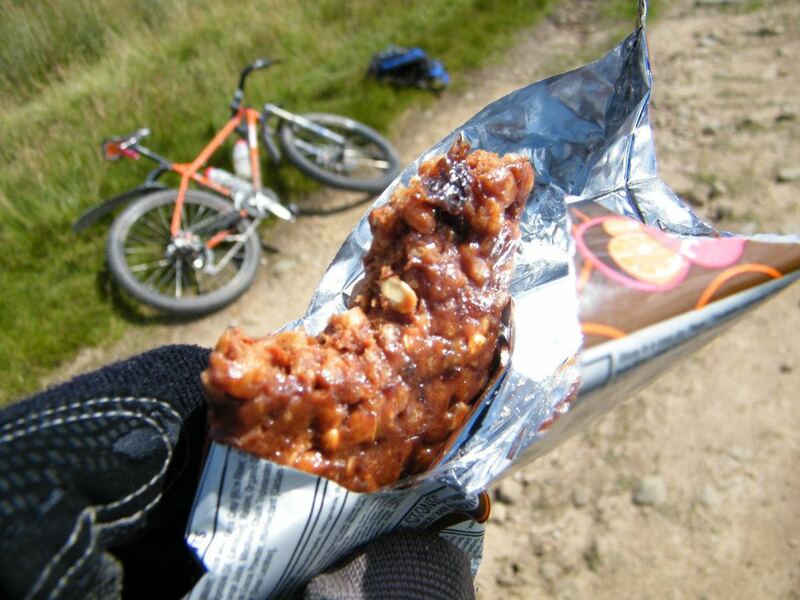 With all that bulk and weight, lesser bikes could certainly become unsettled on the road but my On One Midge ‘dirt drop’ bars provide me with a really wide, comfortable riding position which helps to keep the overall centre of gravity low and the whole load nice and stable.